Heathrow Airport has just announced a brand new super-fast free wi-fi service. I was in Heathrow on Tuesday morning on my way to Aircraft Interiors Expo in Hamburg, so I thought I would try it out. The results were pretty shocking. Yes, 74 Mbps download speed. Even more amazingly, 72 Mbps upload speed. This was the best of lot – over 80 Mbps for both uploading and downloading. This is very impressive, to put it mildly. It is very close to the ‘up to 100 Mbps’ figure which Heathrow is quoting in its press release. All credit to Heathrow for getting this up and running – let’s hope a few more UK airports follow suit. So it’s likely better to connect to this rather than BALoungeWiFi unless that’s also being upgraded. I’ll need to compare it to the WiFi in the T3 AA lounge. It always seems fast in there but never tried a speed test. Is the WiFi completely free or is the free period time limited (with longer time allowed for Heathrow Rewards members) like it used to be? I logged in via HR and don’t remember a time limit. Not sure about the general log in. AA T3 is good wi-fi. When all the ‘lounge is best’ arguments kick off the one objective knock on the Cathay lounge is the slow wi-fi. Does matter if you’re prepping your Netflix and Prime downloads at the airport. Aldo could get about once bar only Of phone signal and only near thé windows when I tried in QF lounge T3. No data signal. It was even worse than CX lounge signal. Didn’t know Boingo was a plat benefit. It does come as a benefit of the paid Virgin card I think. I know I have an account and now uncertain as to how. I find in the places I tend to travel that the roaming deals are now priced OK and care less for finding WiFi hotspot services. It’s been threatened that Boingo’s leaving for years, but I’ve still got access via Amex Platinum. Comes in very handy overseas, especially airports. @AndyGWP that was my impression too – only used it rarely when roaming but was handy. 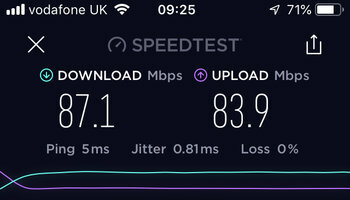 This is still actually slower than the speeds I usually get tethered to my mobile on Vodafone – I think they’ve added hundreds of tiny cells throughout Heathrow, and I usually get 100-200Mbps. Arlanda guest 128 download, 193 upload. Is there a link to the press release rob? No, I get them emailed. 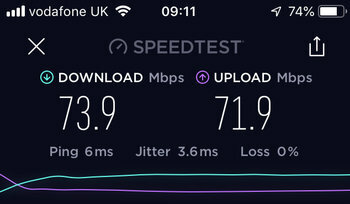 In the BA Arrivals Lounge right now I get 3Mbps download and 1Mbps upload. Is this upgrade just at T5 or all terminals? 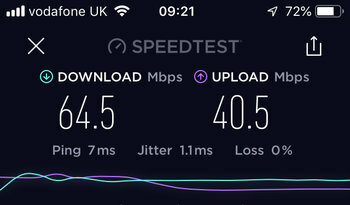 Kinda O/T – Stayed at the Premier Inn Gatwick North Sunday night – truly truly dreadful free wireless speeds, the kind I have not seen since dial up connection. 100 – 150 kb/s based on a speed test. Not sure if this is a desperate attempt to get people to pay for the “Ultimate” wifi which is £5 a night. Why would you possibly need more than this at an airport? Because at low mbps thé signal is often patchy and variable as well. You just try opening any ‘loaded’ attachement or even a modérateexcel file that miht be attachéd to an email if you:ve only got low mbps. Still disappointed to find that they want access to either my Twitter or Facebook accounts, or to give them personal details directly. In Canadian airports, I always get decent WiFi without doing anything more than clicking a button. You can log in with a Heathrow Rewards account. It took me two days and two rounds of emails to restore my password recently as they changed the way how people log in and there were some circular errors preventing people from logging in. Just be aware! I wish X ray was as super fast and speedy. My last international trip to Asia found the staff extremely rude even though my husband was pushing me in a wheelchair. We had no help , only insult. Used it yesterday and it was strong enough to watch Sky Sports on my iPad at the T5 bus zone.